A figure that’s vaguely reminiscent of soda bottles and cans hoists a larger-than-life nickel over its head. “This is a playful piece, but it also has a real message,” said Chris D’Arcy. She chairs the City of Salem’s Public Art Commission. Since Oregon’s bottle bill took effect, nine other states have also enacted some form of a beverage container deposit. Oregon lawmakers in recent years have expanded the original bottle bill to now include most types of beverages, including juice, water and iced coffee. The original $.05 deposit has also been doubled to ten cents. The $30,000 sculpture is located in a small park at the southwest corner of Trade and Church Streets in Salem. It’s called “Good Cents,” and was funded through a mix of public and private donations. 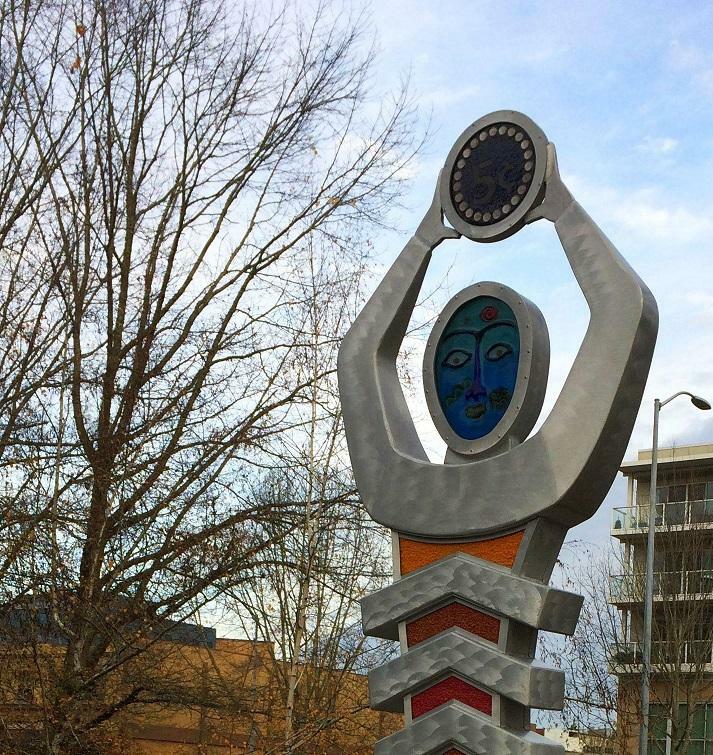 It was created by Oregon artists Lillian Pitt and Mikkel and Saralyn Hilde. 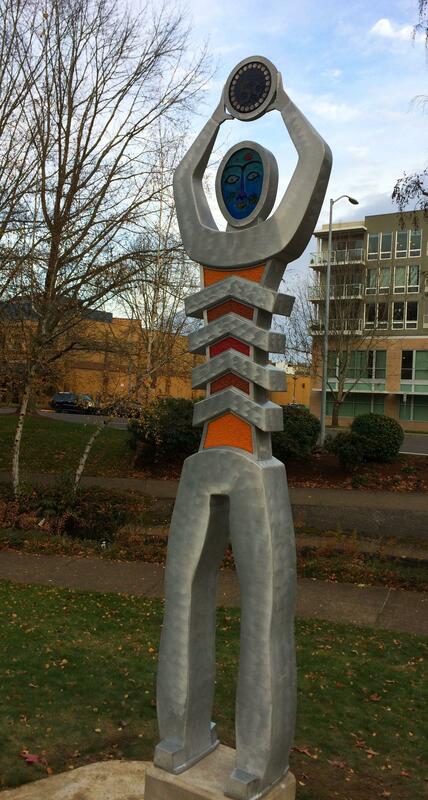 The sculpture will be formally dedicated on December 13 at 12:00 p.m., with a ceremony featuring Salem Mayor Chuck Bennett and a group of Oregon lawmakers. CORRECTION: Containers that are marked with a 5-cent redemption value will still be accepted for return in Oregon. The state bottle bill program has corrected a press release sent out Monday that incorrectly stated 5-cent containers would no longer be redeemable. The sale of beverage containers with a 5-cent refund value will no longer be allowed after September 30th. Time is running out for Oregonians who’ve put off turning in their bottles and cans for redemption. Beverage containers marked with a 5-cent refund value must be redeemed before the end of the month. A nickel isn’t what it used to be. Back in the 1970s, two nickels could buy you a postage stamp, and a just few more could get you a loaf of bread. So when Oregon’s Bottle Bill went into effect in 1972, the nickel deposit on a soda made people take notice -- and return empties that were a large part of Oregon’s litter problem. Not so today. But changes are underway to get Oregon’s plummeting bottle return rate back to early levels. Redemption centers continue to pop up. And Oregonians will likely see the deposit raised to a dime sooner rather than later.